Tvisha wakes up every morning at 5:00 am to pack lunch boxes for her two children, who go to municipal schools. The younger one, a boy, aims to be a pilot one day. Her daughter has not thought about what she wants to be but is interested in science. Tvisha’s day is hardly over. 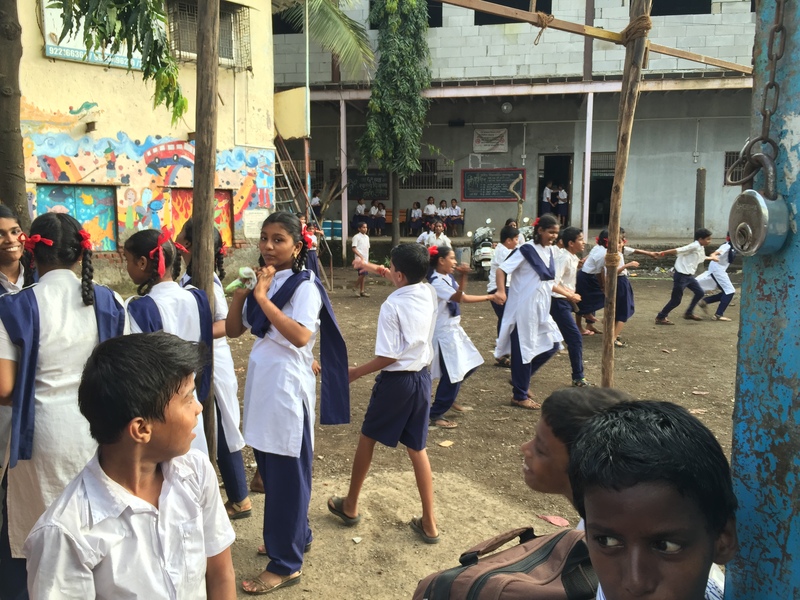 At 7:00 a.m. she travels to the DS school in Sion where she teaches Marathi and Hindi. It is a private school, although her own children attend aided schools. She, however, prefers private schools as they teach better discipline and give more personal attention. Municipal schools in her eyes are over-crowded and prioritize their “government work.” After finishing her work by 1:30, Tvisha is back home to see her children return from school. Later, either at 3:30 or in the evening at 6:30, she takes tuitions for 10th graders at an academy nearby. Space is not a problem in the classes (which conducts 25-40 students each time) since the academy pays for the rent. When asked about why she takes tuitions, she explains that her school does not pay to her satisfaction, and she also has a lot of free time she can use productively. She negotiates her salary with the owners of the academy, and thus far it has gone well for her. No other woman in her immediate family has a job. Her sisters are housewives like their mother was. Although at first Tvisha wanted to explore law, she decided to become a teacher because she saw her friends becoming teachers. So she pursued a Bachelors in education in 2000: soon after, she was married at 28. I wonder out loud if that is unconventionally late for marriage in her society but she tells me almost proudly, that it was a love marriage and it took 6 years to convince her parents to get on board. But it is clear that the family has reconciled and is happy, as her mother sits approvingly beside Tvisha the entire duration of the interview. She even offers her inputs- talking about her late husband’s railway job, and even locating the village that they originate from, in the district of Sangli. On which job she most prefers, Tvisha says its teaching at the school. Even though she earns less there, schools have more activities and events that she can participate in, she clarifies. She initially wanted to teach at a Marathi-medium school as Marathi was her forte, but recently Marathi medium schools are being shut down all over; every school these days seems to be making a conversion to an English medium school. Due to lack of vacancies, she is now teaching at an English medium school. So far, the feedback to her teaching has been good. A student of hers recently topped in the Sion area at 96% too, she enthusiastically informs. This is in part due to her teaching process, which includes student input. Typically, she teaches the specific topic the class suggests and makes them read the textbook content out loud. Then, she asks them questions to check on retention. So what does she do with this additional income? She and her husband both like to travel, she says. Despite his busy work in the circulation department of a media company, they have managed to find time and finances to explore Delhi, Amritsar and Goa, among other places. She believes that enjoyment is key to living a good life. The rest of the money is “invested” into a bank account. Her husband pays for the children’s education and even their tuitions. They go for tuitions because she cannot teach them subjects other than Hindi and Marathi, and she also does not have time. Plus, they confess, it is the norm to go for these extra learning hours even though the schools are of adequate quality. She is sure that her children will move somewhere outside of Dharavi. Tvisha and her husband themselves want to move out- ideally to Sion- but are keeping plans on hold due to the good income they earn from jobs that are close to their home. She does not want to live in a “slum area”, even though she likes Dharavi and has family history here, for the sake of her children. There are street brawls outside their doors often, and older boys use offensive language, which might negatively impact the two of them. She says redevelopment talks have been going on since she was little, but don’t seem to be coming to fruition. She adds, “It would be good, especially for the children, if there was space to move properly and park cars”. In her eyes, it would even solve water infrastructure problems for slum dwellers. Her mother jumps in to talk about the inconvenience of walking children to the public bathrooms every morning, to which Tvisha defensively adds, “But of course we have our own bathroom.” She seems happy with her current life, noticeably unable to come up with any complaints about her job or lifestyle. One thing she is concerned about, however, is the job scarcity in the market for graduates. She wishes the government would tackle this problem, especially due to the rising inflation in recent years.